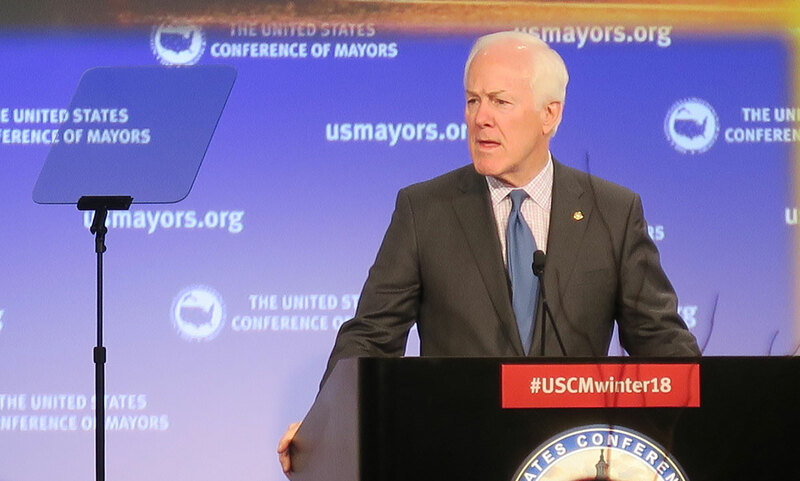 WASHINGTON — Sen. John Cornyn (R-Texas) touted his recently introduced infrastructure bill as a way for states and municipalities to finance highway projects during a recent meeting of the nation’s mayors. The Building United States Infrastructure and Leveraging Development Act (nicknamed the Build Act) proposes to amend the Internal Revenue Code so that the national limitation on the amount of tax-exempt highway or surface freight transfer facility bonds is increased to $20.8 billion from $15 billion. The bill, proposed Jan. 18, is co-sponsored by Sen. Mark Warner (D-Va.). Cornyn praised targeted infrastructure projects as a solution for the “coming-apart problem” that he said characterizes some American cities. He cited a park that was recently constructed over a prominent overpass in Dallas, thereby connecting neighborhoods that previously did not interact. The Build Act would raise the caps on a specific type of funding called private activity bonds, which assist in infrastructure construction. Cornyn, who serves on the Senate Finance Committee, said projects such as these are important because cities are increasingly becoming hubs of technology in which signs and vehicles can communicate with each other through connected networks. And as the Senate begins to consider infrastructure legislation, the White House is preparing to unveil a long-awaited infrastructure plan. While details of President Donald Trump's more than $1 trillion, 10-year infrastructure plan are not yet final, the White House has explained that $200 billion would come from federal accounts and the remaining $800 billion will come from private-sector investments. At a meeting with mayors Jan. 24, Trump said the plan will be released shortly after his State of the Union address Jan. 30, and probably will create an investment slightly larger than the initial $1 trillion projection. “We’re also working to rebuild our crumbling infrastructure by stimulating a $1 trillion investment, and that will actually, probably, end up being about $1.7 trillion,” Trump said at the meeting. “We’ll probably be putting that in a week or two, right after the State of the Union address. Certain mayors have expressed skepticism that $200 billion is enough to spur infrastructure projects at the state and municipal level. Chicago Mayor Rahm Emanuel, who addressed the other mayors, flatly said that the infrastructure plan does not supply enough funds for states hoping to conduct infrastructure projects. Emanuel, who was chief of staff to President Barack Obama, doubted that the upcoming plan will be effective. As the mayors discussed infrastructure Jan. 24, however, the Department of Justice ramped up pressure on so-called sanctuary cities seeking public safety grant money, warning that they could be legally forced to prove they are cooperating with federal immigration authorities. That move prompted immediate backlash, with the mayors — causing some to boycott the meeting with meeting with the president.